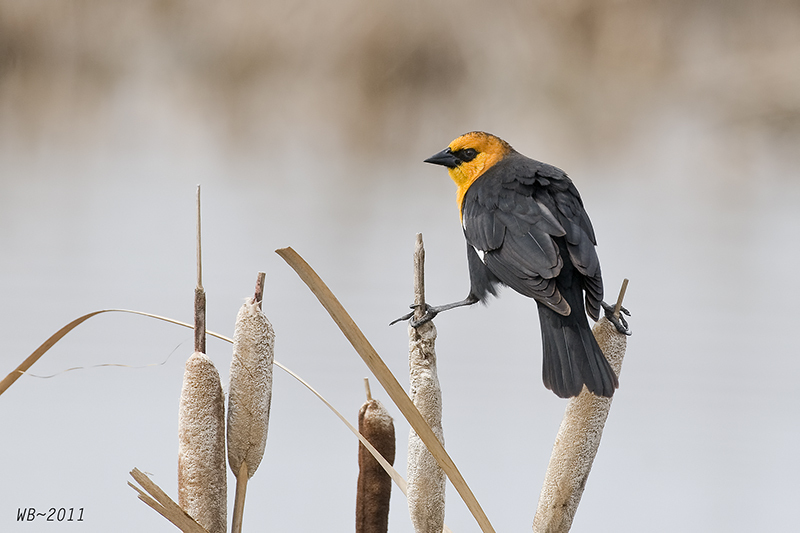 The wetlands with cattail growths come to noisy life in late April and early May. The male blackbirds are back, often three kinds in the same marsh, competing with each other for prime nesting territory. The three blackbirds mentioned here all belong to the Icteridae (a Latinized derivation from the Greek ikteros, "jaundiced one," on account of yellow as a prominent plumage colour in many, but by no means all of the Icterids) that includes all varieties of New World Blackbirds and Orioles, as well as the Meadowlarks, and the Bobolink, close to a hundred species in all. 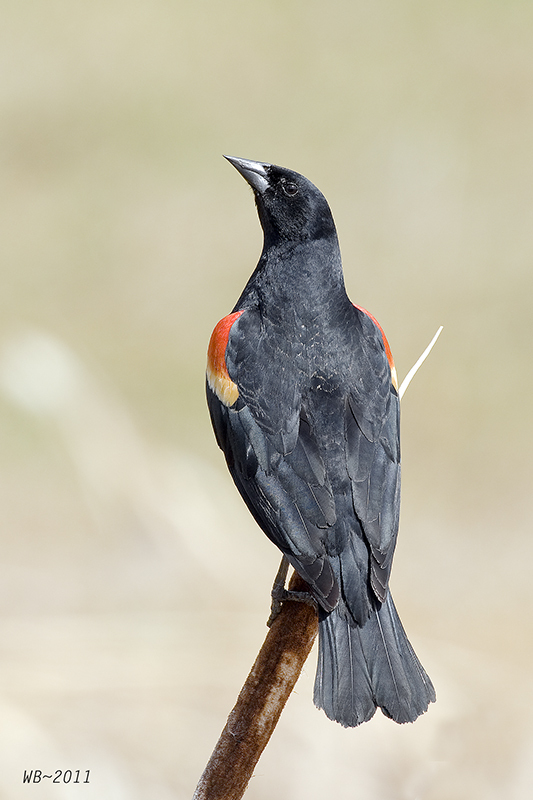 This is one of the oddities of taxonomic classification: Icterids = Blackbirds. Not all black birds are Icterids and not all Icterids are black -- nor jaundiced, for that matter. Going up one level in the taxonomic pyramid, the Icteridae are a family that belongs to the order Passeriformes, Songbirds. Yet many of the Blackbirds, the three species mentioned below, for example, can't carry a tune to save their wings. The Icterids are found only in the Americas. 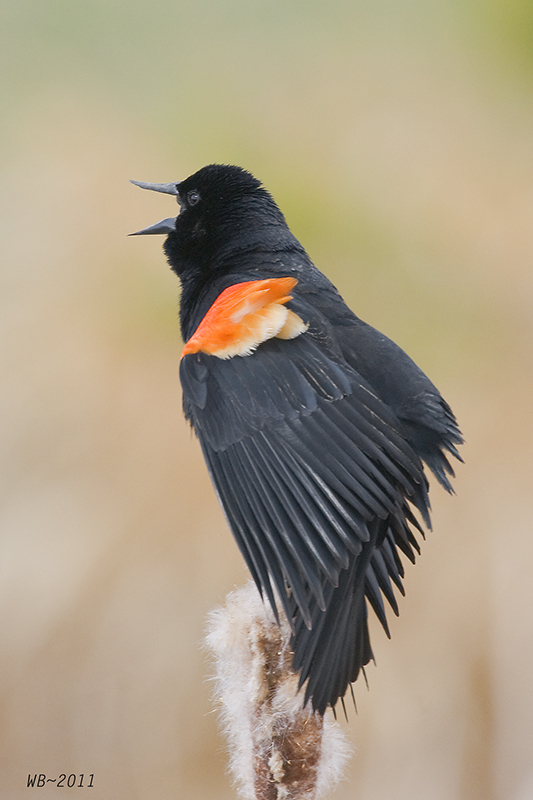 In Alberta, their early arrival and their throaty, growling "song" are happy indications of the return of spring. The boldly coloured Red-winged Blackbird (Agelaius phoeniceus) is the most familiar sight atop cattails. 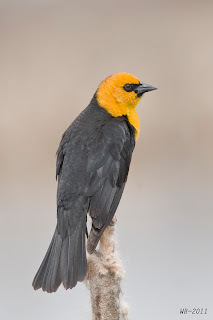 Glossy-black males have scarlet and yellow shoulder patches they can puff up or hide depending on how puffed up they feel. Its Latin name is derived from the Greek terms agelaios ("belonging to the flock") and phoinkeos ("purple-red" or "crimson," i.e., deep red). 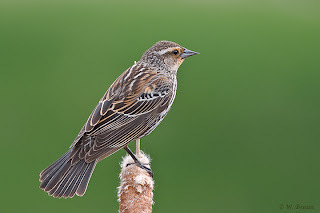 The history of the classification of this bird is interesting. Linnaeus, the 18th-century father of scientific classification of species, called it Oriolus phoeniceus, identifying it in relation to a another species. Later it was moved to the Agelaius family, an identification based on its behavioural trait of living in flocks. 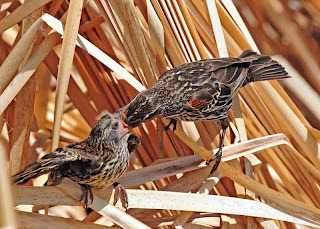 Females are a subdued, streaky brown, almost like a large, dark sparrow. 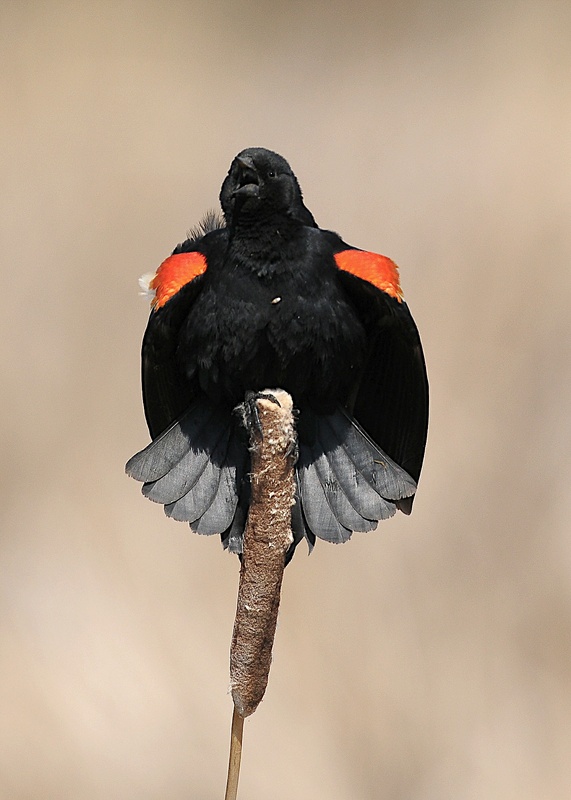 Male Red-winged Blackbirds are not shy; they do everything they can to get noticed, sitting on high perches and belting out their honk-a-ree song all day long. "Song" is overstating it. Though not unpleasant to the human ear, their song is remarkable more for its volume than for its tonal beauty. 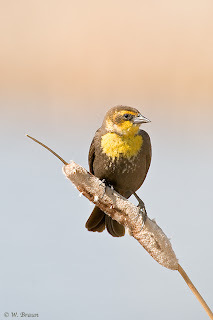 They are aggressive defenders of their territories during the breeding season, spending more than a quarter of daylight hours in territory defense. He chases other males out of the territory and attacks nest predators. 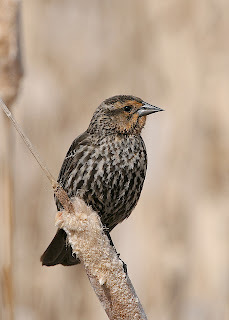 Females are more subdued, staying low, and skulking through vegetation for food and quietly weaving together their nests and later feeding their young. The Red-winged Blackbird is a highly polygynous species, meaning males have many female mates – up to 15 in some cases. But research has shown that the territorial male may not be able to prevent his females from hanky-panky with other males: according to the Cornell Lab of Ornithology up to a half of nestlings turn out to have been sired by someone other than the territory holder. 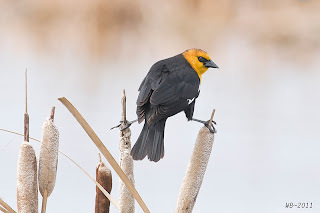 The Yellow-headed Blackbird is a startling, conspicuous, and quite beautiful breeding bird in many prairie deep-water wetlands with cattail or rushes. 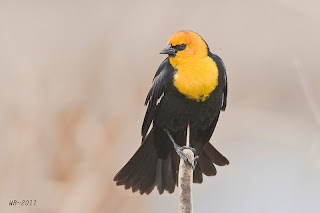 Its name, Xanthocephalus, means “yellow head,” a remark on the male’s striking saffron-yellow head, neck, and breast that contrasts sharply with the black plumage on the rest its body – except for a white wing patch that is visible in flight. 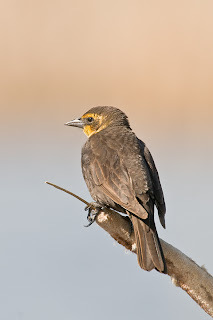 Females and young males are duller in plumage: bodies dull black and brown, with pale yellow primarily on breast and throat. The YHB is classified among the songbirds, but frankly, this must be an embarrassment even in the bird world. Its song, if you can call it that, is a hoarse, scratchy buzzing noise. 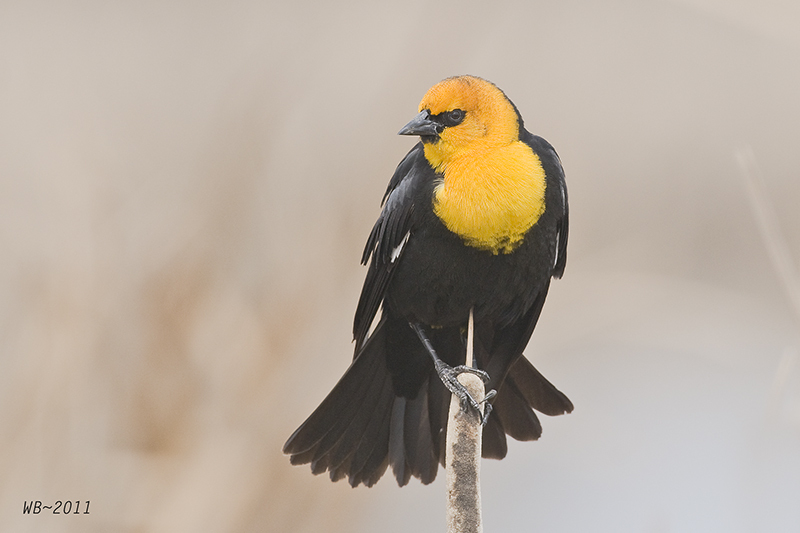 Imagine the sound of an opening barn door that sits on very rusty hinges and you come close to the noise of the Yellow-headed Blackbird. Not really pleasant to the human ear, but amusing nonetheless. 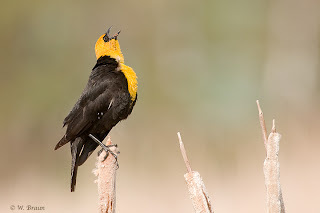 What counts is that it is pleasant to the ears of female YHBs – or, possibly, threatening to other males and other intruders. 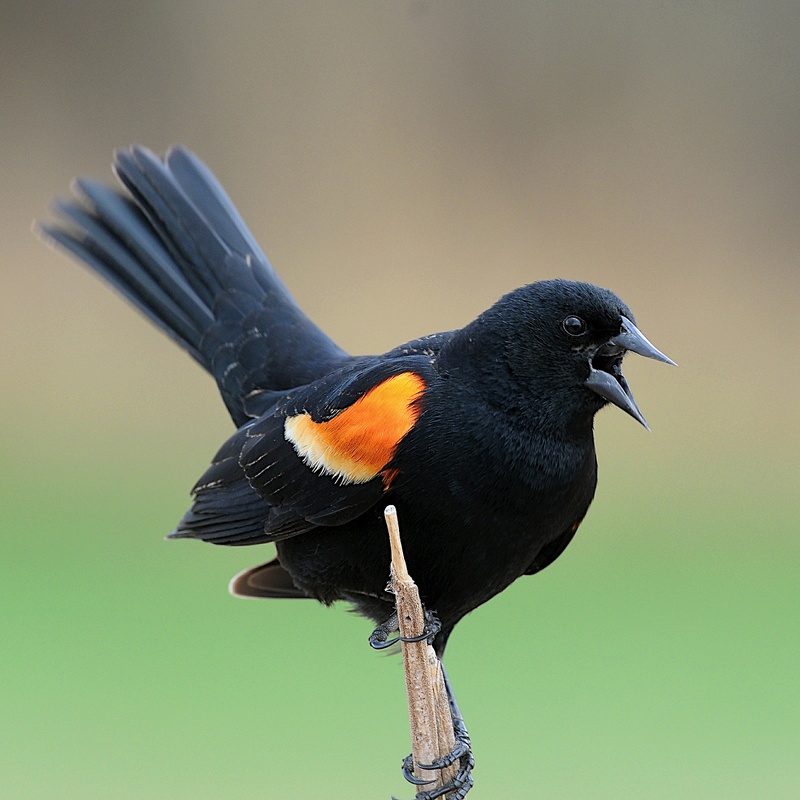 Highly social, these large-bodied blackbirds breed in loose colonies that consist of grouped territories. 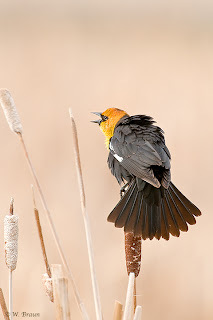 The male defends a small territory of prime nesting reeds. 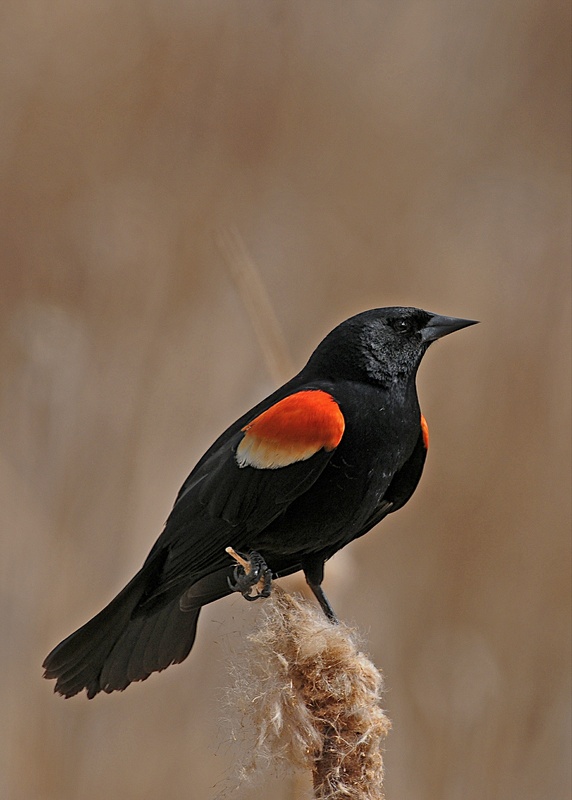 Like the Red-winged Blackbird, this species too is polygynous – each male attracts up to eight females to nest within his area. Males arrive first at breeding locations and compete with each other for prime real estate before the females arrive. 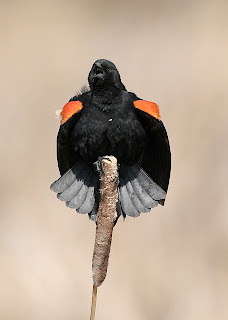 When the girls do show up, they select nest sites within a male’s territory. Nests are constructed by the female. The are always placed over open water and consist of a cup woven of strips of reeds, attached to reed stalks. The YHBs clearly are the rulers of the cattails. 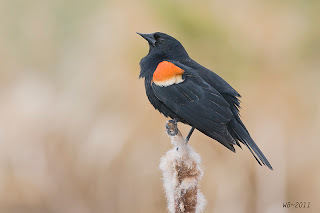 They often, but not always, nest in the same marsh as the Red-winged Blackbird and the Common Grackles. 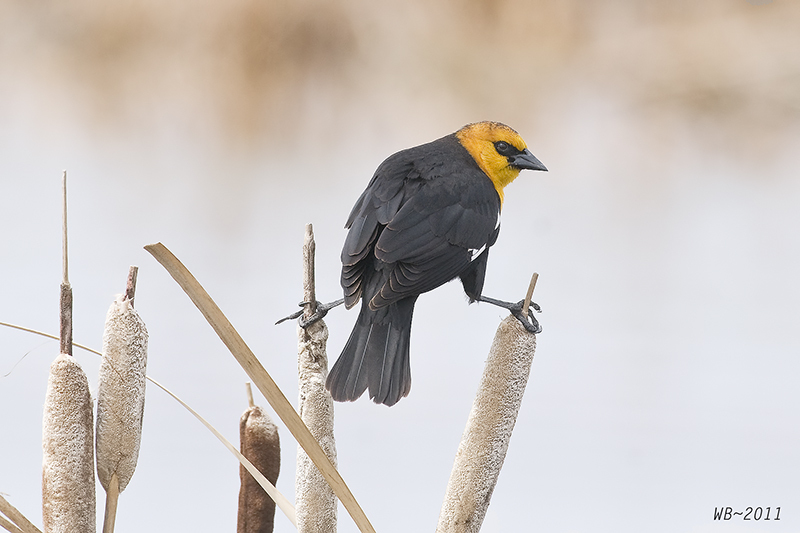 The larger Yellow-headed Blackbird is dominant to the Red-winged Blackbird and displaces the smaller blackbird from the prime nesting spots. 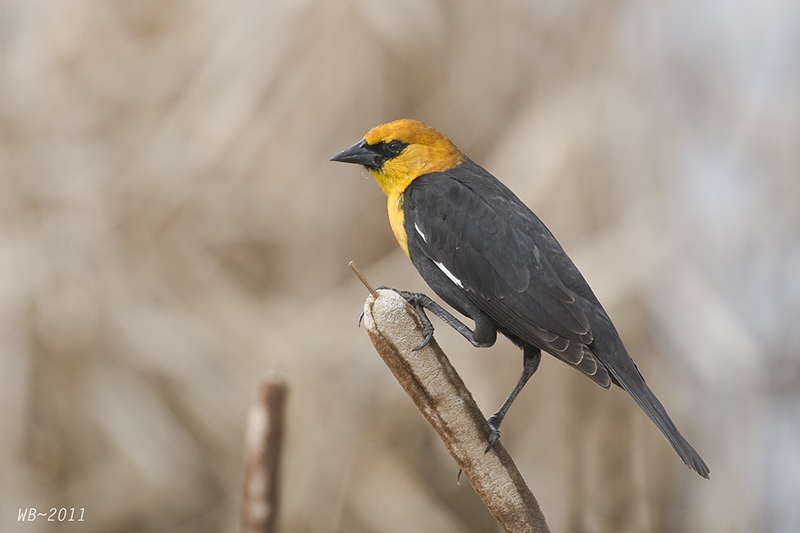 The Yellow-headed Blackbird is also aggressive toward Marsh Wrens, probably because the Wrens’ habit of destroying the Blackbird’s eggs. Among the entertainments that some cattail marshes offer is the shouting matches between Blackbirds and Marsh Wrens. 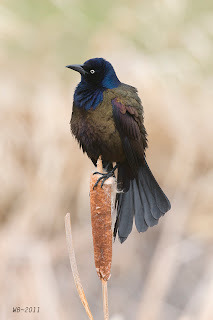 In my area, central Alberta, another blackbird that is often found in the same cattail marshes as the RWB and YHB is the Common Grackle, the largest of the three species mentioned here. Its scientific taxonomic name is Quiscalus quiscula. Both names (first = genus, second = species) are puzzling because they derive from the Latin word for quail, even though there is nothing quail-like about the Grackle. I have been trying to find an explanation for this but have not found one so far. 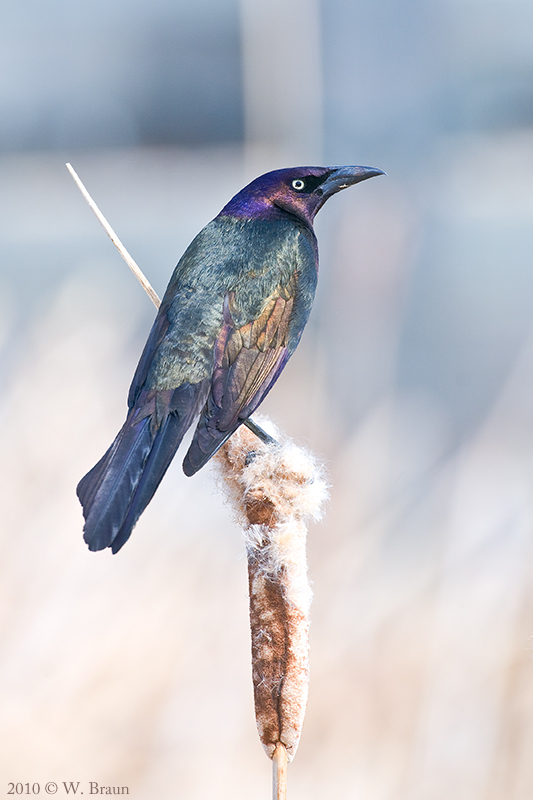 Why Grackle as the common name? This comes from the Latin graculus, a term that is used to refer to Old World birds that are closely related to our crows -- jackdaws and choughs, for example. The Grackle does have some faint crow-like features, such as the size of its beak, its overall size, and its habit of rooting for grubs and other food items in lawns and fields. For these reasons in some areas folks refer to it as the Crow Blackbird. During the breeding season the birds are stunningly gorgeous; they sparkle with rainbow-like iridescence, the hues changing as the angle of light changes. 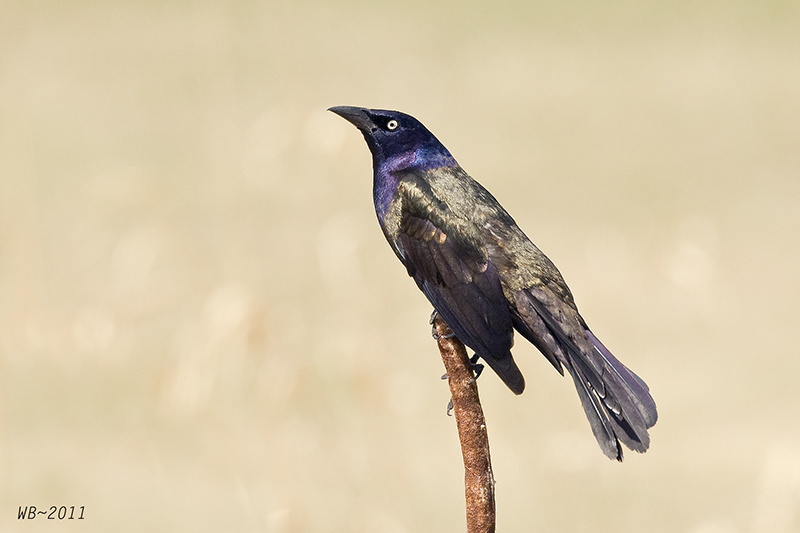 There are actually two forms of the Common Grackle, the purple Grackle and the bronzed Grackle. The first is found in the southeastern US, the second everywhere else, including in my region. Notice its bronzed body, especially in the first picture above. Grackles live in flocks and are not as habitat-restricted as the other Blackbirds, both for nesting and food, but in some places they inhabit the same marshes as the other two blackbirds. They are virtually omnivorous. This too is a songbird by taxonomic classification only, not because of the tonal quality of its vocalization. 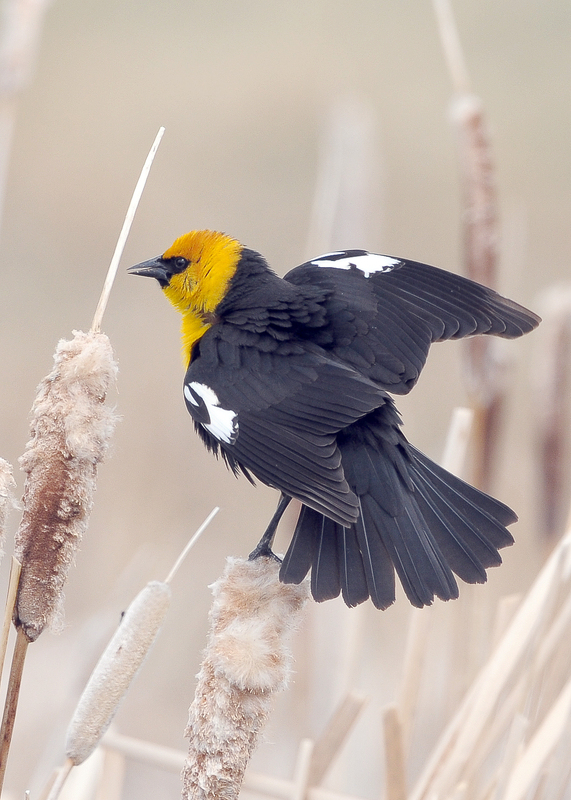 Pete Dunne, a renowned American bird expert, has it about right: "Noisy! Song is loud and harsh -- a gutteral protest followed by a breathy, strangled screech." 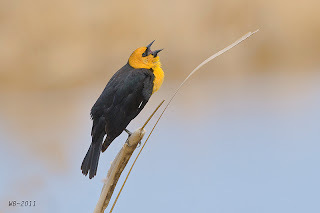 So, Songbirds they all are, songster, they are not! They are noisy, conspicuous denizens of our wetlands. They come early to announce the end of our long winters. I love them and look forward to their arrival. 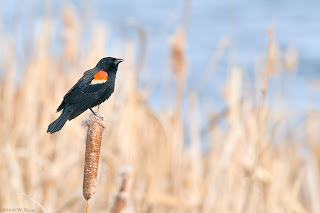 In fact, this year I was so eager for winter to end that I drove out to the local cattail marshes regularly from early April on, hoping to be there when the first of the Blackbird boys arrived.